Many people who know me tend to think I have an adverse hatred to fruits and vegetables. Although, I must admit, I am partly to blame. I do not quite fancy these healthier alternatives of edible type. I love meat. It’s as simple as that. Give me the option of bacon or an apple at any part of the day, and I’ll take the bacon. It’s not that I hate fruits and vegies, I just prefer not to have them as often. I do like french beans, pea sprouts, assorted leaves, oranges, pears, etc. What I would rather like to eat though, is another matter altogether. I can go on for the next couple of paragraphs on this topic, however I won’t bore you with that. I would much rather entertain you with how the Boy has me craving for persimmons and quinces! How has he worked this miraculously change in me? Quite easily really. With applying certain cooking techniques, such as grilling and poaching, he couldn’t have me begging for more fruits on a platter. And here’s how he did it! Place water, sugar, lemon and vanilla into a heavy-based saucepan and bring it to a boil under a medium-high heat. 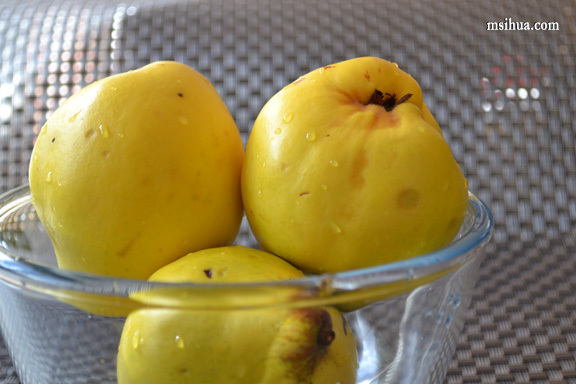 While waiting for your poaching liquid to reach boiling point, peel your quinces. Quarter and core the fruit and immediately add them into the poaching liquid. Place a cartouche with a small hole in the middle over your poaching quinces. Cover your saucepan with the lid. Reduce to a simmer and cook for around 1.5 hours or until the quinces are cooked through and turns ruby red in colour. Reserve 1/2 cup of quince syrup (poaching liquid) produced for the Grilled Persimmons. The poached quinces can be kept (with the remaining poaching liquid) and be eaten with ice cream or as a breakfast accompaniment. Add the 1/2 cup of quince syrup into a small saucepan on low-medium heat. Leave it on a gentle simmer and reduce the syrup by half. Careful not to burn it. If my maths are right, you should be left with 1/4 cup of concentrated quince syrup 😀 Transfer to a glass beaker or serving glass and leave to cool. 3-4 Persimmons (riped) -*this really depends on how many persimmons you are willing to serve. Peel the persimmons and cut them into wedges. Lightly brush/spray your griller with a neutral-flavour oil like grapeseed oil (very little oil, just to prevent sticking). Heat the grill up. Once it gets hot enough, place persimmons into the griller and grill each side till grill marks appear on them (this should give it some nice caramelisation). Try not to overcrowd the griller (grill in smaller batches). Do not over-grill them, you want the persimmons to have that crunchiness when you bite into them. 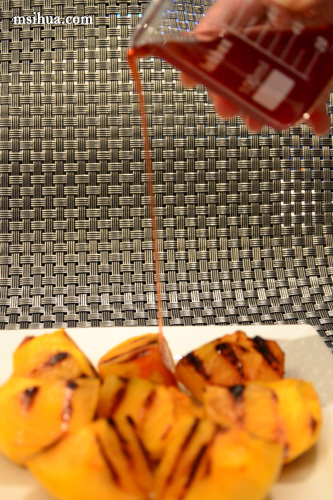 Once the grilling is done, place them on a serving platter and pour your quince syrup (prepared earlier). Crunchy sweet persimmons paired with beautifully perfumed syrup. MMmMmmm…. So what are your favourite foods, and what do you least like to eat? I still wouldn’t do brussels sprouts or bitter-gourds though. Not even if you wrapped it in bacon. I’m a total meat eater. My bf always has to tell me off for not eating my greens and fruit. I guess I’d eat them if they were in front of me though but I’d never go out of my way to get it myself. My favourite fruits are cherries and mango, maybe strawberries too. But meat, loveeee meat. Pork belly, confit duck, lamb cutlets…yummo! I bet it’s good to go with grilled pork too! Thanks Pierre. It was truly a dish by itself.. I love quinces. But still not a fan of persimmons. Trust me! Once you grill it, you don’t go back! Buuuut… would you give away a portion of your pork belly? That’s the ultimate test! Great idea to mix the two flavours together, yumm… I’m definitely a carnivore, no question! The veggies should just be there to enhance the meat eating experience! 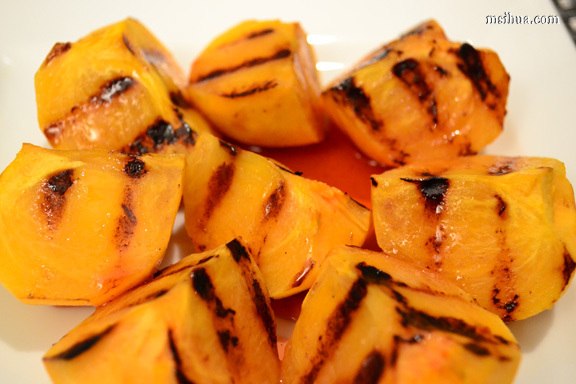 I can’t believe that for as long as I’ve been eating persimmons, I’ve never once grilled them. I know what I’ll be trying as soon as persimmons are available again. Great idea. This looks delicious! I may have to try this on my non-fruit-eating partner! I’m shocked to see that most people here have said their boyfriends have told them off about not eating their greens, my case is quite the opposite! I cannot honestly say that I have seen him eat a piece of fruit for over 6 months! He’s pretty good with his veggies, but I can’t even make deserts with fruit in them (strawberries dipped in chocolate being an exception), but perhaps I will give this recipe a try and tell him that it’s some foreign type of meat or something 😉 hahaha.